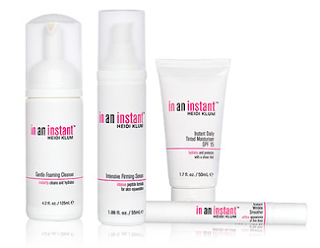 In An Instant is a skin care system by supermodel and mompreneur Heidi Klum. Designed to reduce the appearance of wrinkles, large pores and skin imperfections while building benefits over time with continued use, the best thing about In An Instant is how quick and easy it is to use. There are four main components to In An Instant: Gentle Foaming Cleanser, Intensive Firming Serum, Instant Tinted Daily Moisturizer with SPF 15, and a secret weapon, the Instant Wrinkle Smoother wand. There are two bonus products in the line, a Warming Facial Scrub (feels amazing!) and an Eye Cream. In An Instant is not available in stores but you can purchase an In An Instant 30-Day Intro Kit online for $39.95 with free shipping and handling. I like how reasonably priced the kit is, especially with free shipping. Now I want to see your Heidi Klum-ish after photos!